Laura Thweatt, seen here en route to a 3,000-meter PR in February, lowered her 10,000-meter best on Friday with a win at the Stanford Invitational. Photo by Victah Sailer/PhotoRun. It was a good night for KIMbia athletes running 25 laps at the Stanford Invitational on Friday. 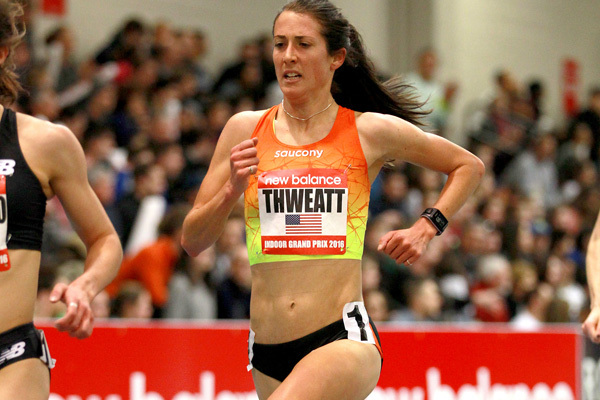 Laura Thweatt won the fast heat of the 10,000 in 31:52.94. The time was well under the Olympic standard of 32:15, and took 23 seconds off of Laura’s previous personal best from three years ago. Laura dispatched her last challenger, eventual second finisher Alphine Bolton, in the last mile. In February, Laura lowered her 3,000-meter PR to 8:57.11. In his 10,000-meter debut, German Fernandez placed fifth in 28:06.64. The performance gives German a qualifying mark for the U.S. Olympic Trials. German said after the race he was bothered by a side stitch, which may have contributed to his finishing outside of the Olympic standard of 28:00.